Ed Avery's question, asked of one of his students at the beginning of the second act of Nicholas Ray's 1956 film Bigger Than Life, is one that may well be asked of Ray himself: Why did Ray refer to Ed Avery—male schoolmarm, beloved husband and father, and soon-to-be cortisone addict—as a Colossus? To stir up trouble: this would seem to be the answer to both questions, or at least that's the usual point of view in the latter case. Most critics writing about Ray's film point to its subversive elements, its incisive critique of 1950s America, keeping up with the Joneses, and slavish consumerism. Avery is an underling, dull by his own admission, and yet his aspirations to a better life—of getting away to one of the many exotic locales framed in the interior of his drab, suburban home; of meeting the standards of affluence even if it means secretly taking a second job as a taxi dispatcher—suggest a man desirous of mastering his fate. Cortisone seems to offer Avery the stance of a Colossus, as does Ray's low-angle framing, if at the expense of the safety of Lou and Richie, his wife and son. But if subversion and trouble are in Ray's arsenal in Bigger Than Life, to what ends? Critical readings tend to differ on the precise thrust of Ray's critique of middle-class America: Is it that Avery's addiction exacerbates a perversely conservative Fifties mentality, one stressing “the good old virtues of hard work and self-discipline and a sense of duty,” into self-destructive megalomania? Or is it the catalyst he needs to break through the repressive environment of home and society in order to control his destiny? In short, is Avery right, or does Ray at least want us to think so? Chalk Rosenbaum up to the former team; Truffaut to the latter. Writing in 1957, Truffaut even goes so far as to echo Avery's misogynist claims about Lou, his wife, obliging us to admire the film's portrait of "the relationship of an intellectual with his simpler wife . . . who feels things but has given up trying to express them, since she cannot handle language." It's a tough reading of the film, and not an impossible one, but one I find a little difficult to buy into, if only for its suggestion that we also accept Avery's authoritarian position, his role as superhuman, teacher and doctor, Caesar and Colossus. To wholly accept Avery's logic is to accept a patently contradictory line of reasoning, one that seems to valorize the plight of the individual even as it espouses the rigorous denial of childish whims and willfulness. But then, Bigger Than Life is a film filled with such contradictions, such paradoxes and confusions of emotion and reason; indeed, these are part of what makes it big and ugly and beautiful as life, even in its outsized proportions. And these proportions are measured first and foremost by James Mason, whose perfectly vivid realization of Ed Avery gives the film its minuteness and scope. Mason himself is liminal in dimension and character—diminutive and grandiose, soft and imperious—and his transatlantic accent and professorial bowtie fit Avery as both milquetoast and tyrant. Even in the depths of his cortisone benders, he exhibits a variety of responses that are surprising and even enviable —increased vigor, appetite, libido, and ego—before they crash into depression or didacticism. Always a shrewd melodramatist, with a particular eye for the domestic space no doubt honed in his teenage apprenticeship with Frank Lloyd Wright, Ray builds this sense of conflict into the Avery home itself, with its frequently competing horizontal and vertical patterns: the up-and-down lines of the curtains and stair spindles contrast with those of the stairs and the slats on the doors and partitions. After Ed’s initial collapse, and while he prepares for his first trip to the hospital, Wally and Richie can be seen chatting on the stairs, competing visual patterns—to their left the rug's wavy-lined pattern, and to their right the shadow of ornate stair spindles—penning them in. When Avery plays football with Richie in the living room, inevitably breaking a vase in the process, it’s as if he means literally to break the “atmosphere of petty domesticity” with which his wife has trapped him. (Conversely, Lou is literally trapped in the closet by the end of the film.) This is a world of conflict and confinement, which Avery's newly oversized ego threatens to rupture, and which Ray’s CinemaScope itself seems too big for. The center of this world is of course the staircase, the communicating link between the public and private worlds of the family, and this is the site of the final schism, where Avery’s egomania is brought crashing down to earth. Avery is a divided self, caught between obligation and individualism, a common struggle in Ray's male melodramas of the period. Like the characters in The Lusty Men, Ed wavers between a home on the range and a return to a fabled past of freedom and glory, and his perspective on each becomes distorted with his swelling sense of self, inflated like his “stewed-prune” trophy football. 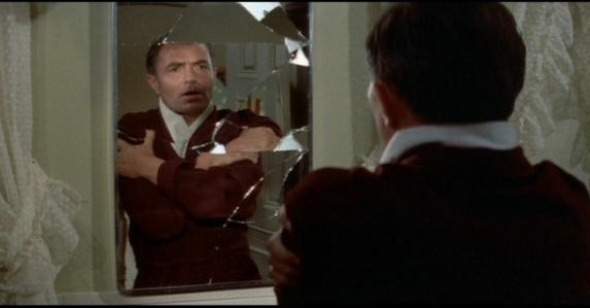 The previous year, in All That Heaven Allows, Douglas Sirk showed us Cary Scott's reflection in her television screen as the image of the complacent suburban widow, but Ray uses mirrors to the opposite effect, as the evil Abraham who catches Richie trying to steal his meds, and as the arrogant lord of the manor, smoking and preening himself in the mirror as his wife draws his bath. It is this image that becomes cracked, fractured in Lou's rare outburst at her husband's altered personality. And indeed, this alternate identity has to be reduced, brought down to earth, in order for the family to survive. It has to be said, then, that Bigger Than Life, like Rebel Without a Cause, is a fairly conservative film when it comes to the question of family. Even without the faith in “miracle drugs” or the other perquisites of Fifties bourgeois America, Ray still maintains that the familial unit is the ideal to strive for, even if he cannot manage to take us all the way there, out of the hospital and back into a fully recuperated home and hearth. Rebel’s provisional family is quashed virtually as it is created, and the Averies are reconciled and reunited in the film's last frame in the shadowy confines of Ed's hospital bed. This is no dishonorable grave for Ed Avery, but it's a narrower world that he now willfully draws closer. Bigger Than Life played June 23 at Museum of the Moving Image as part of Reverse Shot's See It Big series.